Happy Valentine’s Day! It’s Mr. Crick’s Sweet Valentine! 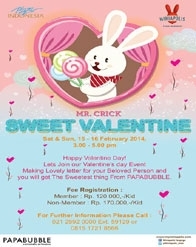 Join our Valentine’s Day event by making special art & craft for your beloved person and you’ll get the sweetest thing from PAPABUBBLE!